But all of this is about to change. Over the next 2 to 5 years, the world around us is about to light up with layer upon layer upon layer of rich, fun, meaningful, engaging and dynamic data. Data you can see and interact with. Massive change is underway as a result of a series of converging technologies from 5G global networks and ubiquitous artificial intelligence, to 30+ billion connected devices (known as the IoT), each of which will generate scores of real-world data every second, everywhere. The current A.I. explosion will make everything smart, autonomous, and self-programming. Blockchain and cloud-enabled services will support a secure data layer, putting data back in the hands of users and allowing us to build complex rule-based infrastructure in tomorrow’s virtual worlds. And with the rise of online-merge-offline (OMO) environments, two-dimensional screens will no longer serve as our exclusive portal to the World Wide Web. Instead, Virtual and Augmented Reality eyewear will allow us to interface with a digitally mapped world, richly layered with visual data. 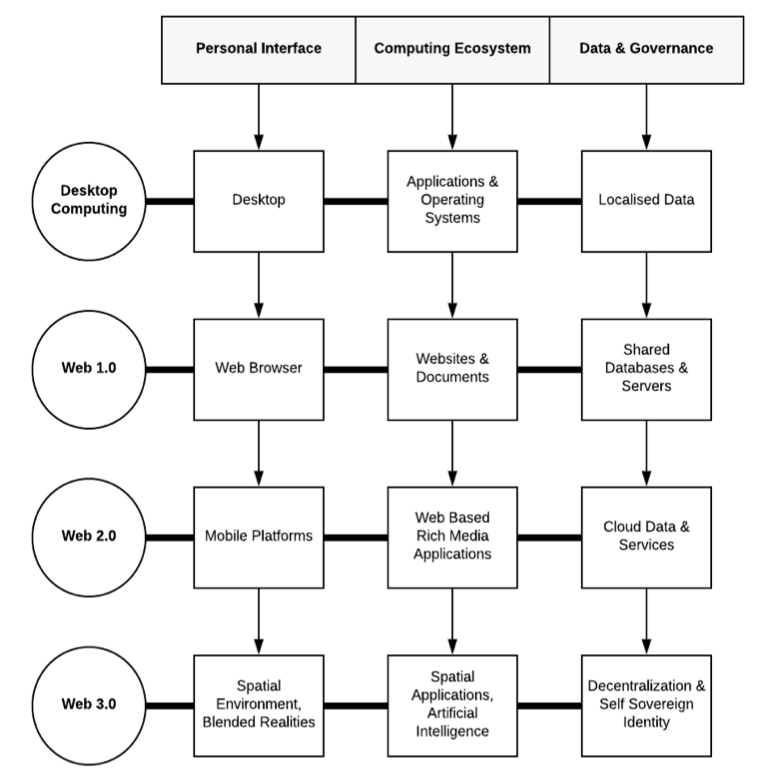 Welcome to the Spatial Web. The web was designed for shared information, absorbed through a flat screen. But as proliferating sensors, ubiquitous AI and interconnected networks blur the lines between our physical and online worlds, we need a spatial web to help us digitally map a three-dimensional world. To put Web 3.0 in context, let’s take a trip down memory lane. In the late 1980s, the newly birthed World Wide Web consisted of static web pages and one-way information — a monumental system of publishing and linking information unlike any unified data system before it. To connect, we had to dial up through unstable modems and struggle through insufferably slow connection speeds. But emerging from this revolutionary albeit non-interactive infodump, Web 2.0 has connected the planet more in one decade than empires did in millennia. Granting democratized participation through newly interactive sites and applications, today’s web era has turbocharged information-sharing and created ripple effects of scientific discovery, economic growth and technological progress on an unprecedented scale. While there’s no clear consensus about its definition, the Spatial Web refers to a computing environment that exists in three-dimensional space — a twinning of real and virtual realities — enabled via billions of connected devices, and accessed through the interface of Virtual and Augmented Reality. And decentralized computing: both blockchain — which enables greater security and data authentication — and edge computing, which pushes compute power to where it’s most needed, speeding everything up. Geared with natural language search, data mining, machine learning, and AI recommendation agents, the Spatial Web is a growing expanse of services and information, navigable with the use of ever more sophisticated AI assistants and revolutionary new interfaces. Where Web 1.0 consisted of static documents and read-only data, Web 2.0 introduced multimedia content, interactive web applications, and social media on two-dimensional screens. But converging technologies are quickly transcending the laptop and will even disrupt the smartphone in the next decade. With the rise of wearables, smart glasses, AR / VR interfaces and the IoT, the Spatial Web will integrate seamlessly into our physical environment, overlaying every conversation, every road, every object, conference room and classroom with intuitively presented data and AI-aided interaction. Think: the Oasis in “Ready Player One,” where anyone can create digital personas, build and invest in smart assets, do business, complete effortless peer-to-peer transactions, and collect real estate in a virtual world. This digitization of life means that suddenly every piece of information can become spatial, every environment can be smarter by virtue of AI, and every data point about me and my assets — both virtual and physical — can be reliably stored, secured, enhanced and monetized. In essence, the Spatial Web lets us interface with digitally enhanced versions of our physical environment and build out entirely fictional virtual worlds — capable of running simulations, supporting entire economies and even birthing new political systems. Let’s start with the stack. Source: Toby Tremayne, Magic Industries. In the PC days, we had a database accompanied by a program that could ingest that data and present it to us as digestible information on a screen. Then in the early days of the Web, data migrated to servers. Information was fed through a website, with which you would interface via a browser — whether Mosaic or Mozilla. Resident at either the edge of the Cloud or on your phone, today’s rapidly proliferating apps now allow us to interact with previously read-only data, interfacing through a smartphone. But as Siri and Alexa have brought us verbal interfaces, AI-geared phone cameras can now determine your identity and sensors are beginning to read our gestures. While Pokémon Go sent millions of mobile game-players on virtual treasure hunts, IKEA is just one of the many companies letting you map virtual furniture within your physical home — simulating everything from cabinets to entire kitchens. No longer the one-sided recipients, we’re beginning to see through sensors, creatively inserting digital content in our everyday environments. Let’s take a look at how the latest incarnation might work. In this new Web 3.0 stack, my personal AI would act as an intermediary, accessing public or privately authorized data through the blockchain on my behalf, and then feed it through an interface layer composed of everything from my VR headset, to numerous wearables, to my smart environment (IoT-connected devices or even in-home robots). But as we attempt to build a smart world with smart infrastructure, smart supply chains and smart everything else, we need a set of basic standards with addresses for people, places and things. Just like our web today relies on the Internet Protocol (TCP/IP) and other infrastructure, by which your computer is addressed and data packets are transferred, we need infrastructure for the Spatial Web. And a select group of players is already stepping in to fill this void. Proposing new structural designs for Web 3.0, some are attempting to evolve today’s web model from text-based web pages in 2D to three-dimensional AR and VR web experiences located in both digitally mapped physical worlds and newly created virtual ones. Just as we have a DNS for the web and the purchasing of web domains, once we give addresses to spaces (akin to granting URLs), we then have the ability to identify and visit addressable locations, physical objects, individuals or pieces of digital content in cyberspace. And these not only apply to virtual worlds but to the real world itself. As new mapping technologies emerge, we can now map rooms, objects and large-scale environments into virtual space with increasing accuracy. We might then dictate who gets to move your coffee mug in a virtual conference room, or when a team gets to use the room itself. Rules and permissions would be set in the grid, decentralized governance systems or in the application layer. The International Data Corporation (IDC) predicts the VR and AR headset market will exceed 81 million units per year shipped in 2021, with revenues reaching $170 billion by 2022. Already in the next 18 months, two billion devices will be enabled with AR. And tech giants across the board have long begun investing heavy sums. In early 2019, HTC is releasing the VIVE Focus, a wireless self-contained VR headset. At the same time, Facebook is charging ahead with its Project Santa Cruz — the Oculus division’s next-generation standalone, wireless VR headset. And Magic Leap has finally rolled out its long-awaited Magic Leap One mixed reality headset. Mass deployment of 5G will drive 10 to 100 gigabit connection speeds in the next 6 years, matching hardware progress with the needed speed to create virtual worlds. Enabled by a permission-less blockchain, any user — regardless of birthplace, gender, ethnicity, wealth or citizenship — would thus be able to establish digital assets and transfer them seamlessly, granting us a more democratized Internet. With a newly built stack and an interface built from numerous converging technologies, the Spatial Web will transform every facet of our everyday lives — from the way we organize and access our data, to our social and business interactions, to the way we train employees and educate our children. We’re about to start spending more time in the virtual world than ever before. Beyond entertainment or gameplay, our livelihoods, work and even personal decisions are already becoming mediated by a Web electrified with AI and newly emerging interfaces.